Austin Haley Berman, 21, is a student of renowned pedagogue, Li Lin, at The Juilliard School. Berman began playing the violin at the age of five. Former teachers include Robert Lipsett, William and Francesca dePasquale, and Choong-Jin Chang. 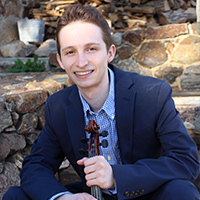 Berman was the winner of the Bronze Medal in the 2016 Stulberg International String Competition and a semi-finalist in the 2016 Irving M. Klein International Competition. He has served as concertmaster of the Music Academy of the West Festival Orchestra, the Aspen Music Festival guest Chamber Orchestra, the Philadelphia Youth and Delaware County Youth Orchestras. Berman has held principal positions in the American Youth Symphony and the Colburn Orchestra. He is currently a first-tier sub for the New World Symphony and a member of the TOMO Quartet of Juilliard. Berman served consecutive terms as a String Leadership Fellow under the tutelage of Glenn Dicterow at the Music Academy of the West. He is a former distinguished fellow at the Aspen Music Festival and an alumnus of the Yellow Barn Music Festival. Berman has made numerous solo appearances in the United States.